Expecting others to make you feel loved while you are abandoning yourself will never lead to feeling loved and lovable. When you learn to take responsibility for yourself emotionally, physically, financially, spiritually, organizationally and relationally, then you will feel loved and lovable. Taking responsibility for loving yourself fills your heart with love, which you can then share with others. Insecurity can be shortly described as “the fear of the unknown” by anyone, but the definition is far beyond that for those suffering from it. When someone is insecure, a lot of things happen. In fact, there are so many kinds of insecurity. We have, Job insecurity, Food insecurity, Political insecurity, Economic insecurity, Financial insecurity (money), Social insecurity, Demographic insecurity, Gender/sexual, insecurity, Health insecurity, Environmental insecurity(biological insecurity), Relationship insecurity/(romantic insecurity), Religious insecurity, Moral insecurity and many others. When all this or one of the aforementioned happens, it affects our views, motivation and most of all, it could crumble our hopes. When we enter an intimate relationship we can feel very emotionally vulnerable; especially if we have been let down or hurt in previous relationships. These are the typical thoughts and feelings of the chronically insecure partner. Feeling like we are not good enough, means that we are not good enough compared to an image of perfection in our mind. Nothing more. 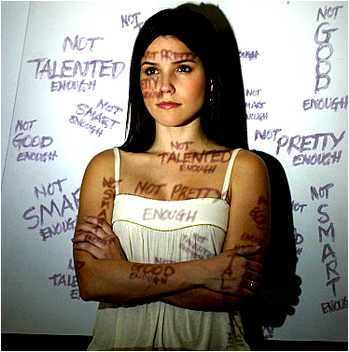 Here are ways to Overcome insecurity. 1. Stop confusing imaginations with reality. You are not alone in this world; you just choose not to share your thoughts. 3. Give the relationship room to breathe: When you plant a seed in the ground, you need to give it access to sunlight, water, and air; you need to give it space to develop. Your relationship needs room to breathe. Schedule in some ‘separate time’ and just see it for what it is. 4. Stop ‘mind reading’: Constantly wondering what your partner is thinking is a quick route to anxiety. If they say one thing don’t assume they mean another. If they say nothing don’t assume that their silence is significant, either. 5. Be optimistic. Focus on the good. 8. Remember all of the success you’ve had. Instead of focusing on all the times you embarrassed yourself, failed at something, or just looked silly, you should take a long hard look at all the times that you’ve done really well. Think of the success you’ve had in school, the great friendships you’ve maintained, or just of random times when you made a group of people crack up because of your winning sense of humor. 10. Do one thing that excites you every day. Conclusion: You are not an Image in your Mind – You Create Them . Lack of awareness about how your mind misleads you can result in failed efforts to improve your confidence, and self esteem. Often people try to prop up their confidence with efforts to become their image of perfection. This great effort usually involves reinforcing the belief that we should be that fictional image. The result is a stronger mechanism for self rejection. With awareness we can avoid chasing these false beliefs and spend our time on what really makes a difference in the way we feel.